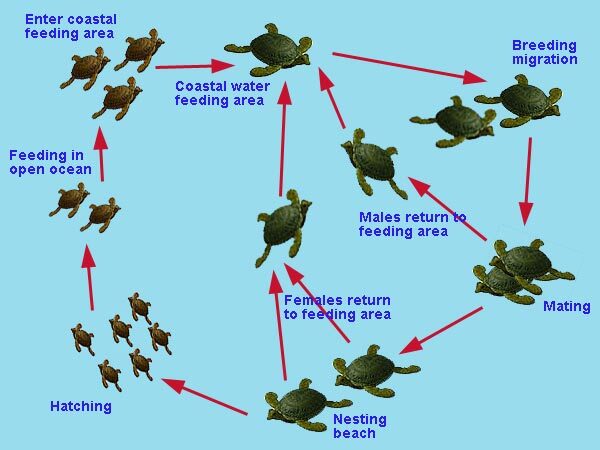 Sea turtle can migrate thousands of kilometres from their feeding grounds to their nesting beaches. Adult females return to nest on same beach where they were born. Turtle migration can be researched using satellites. Transmitters can be glued on turtles of all ages. The signals are picked up by a satellite allowing scientists to study where the turtles go during the various life stages and during different seasons, and can yield important information on physiological behaviours, such as diving patterns. Satellite transmitters can last a few days or a few years as they send a signal only when they break the surface of the water. Satellite tracking can be expensive, with each transmitter costing between US $2,000 and $3,000. 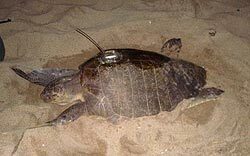 After placement on a turtle and release, satellite time and data management need to be paid for, totaling approximately $6500 minimum per turtle. Transmitters are not recovered if they stop working due to the difficulty and cost involved. Usually this is due to the batteries running down but it can also be due to the death of the turtle, a malfunctioning transmitter, or loss of the transmitter. Some turtles like to scratch their carapace or “sleep” under coral or other marine structures, such behaviours may dislodge the transmitter.